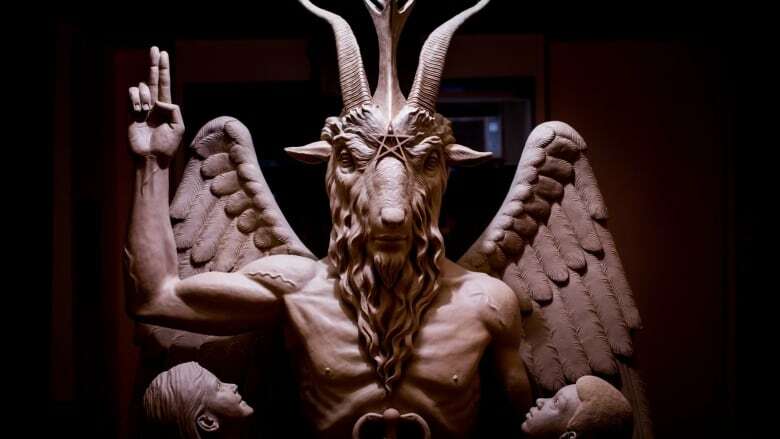 A Satanic organization unveiled a controversial bronze Baphomet sculpture in Detroit just before midnight on Saturday, after trying in vain to have it installed near a 10 Commandments monument in Oklahoma. Due to planned demonstrations, the group, which is opposed to Bible-themed displays on government land, kept the location of the unveiling of its nine-foot-tall monument secret until the last moment, when it emailed the information to ticket holders. The Satanic Temple unveiled the one-ton statue at an industrial building near the Detroit River just before 11:30 p.m. local time as supporters cheered, "Hail Satan." Some of the hundreds in attendance rushed to pose for photos. The statue of a winged Baphomet with a human body and a goat's head resembled a design the group previously released. Statues of a boy and a girl stood in poses of adoration on either side. Jex Blackmore, director of the Satanic Temple Detroit chapter, said temple members planned to transport the sculpture to Arkansas, where earlier this year the governor signed a bill authorizing a 10 Commandments monument on the State Capitol's grounds. The Temple had unsuccessfully applied to have the statue placed near a 10 Commandments monument installed in 2012 on the Oklahoma State Capitol grounds. The Oklahoma Supreme Court recently ruled the 10 Commandments monument violates a section of the state constitution that bans the use of state property for the benefit of a religion. Lawmakers in the socially conservative state responded with threats to seek the impeachment of the court's justices and pledged to push for changes to the constitution. Oklahoma Governor Mary Fallin, a Republican, said she will keep the monument in place as the state appeals the decision. On Saturday, the presentation of Baphomet in Detroit drew protest from local Christians. About 50 people prayed for the city and denounced the monument outside a business where the Satanic Temple previously tried to display the statue before fears of a backlash scuttled the plan. "The last thing we need in Detroit is having a welcome home party for evil," said Reverend Dave Bullock, a pastor at Greater St. Matthew Baptist Church in Highland Park, Michigan.